Nathan LOVES the snow this year...too bad it came and only stayed for 2 days. John is so glad but it makes me sad :( Nathan wants some more snow too so hopefully we get some more before the season is over (I'm sure we will in North Idaho). John had to work around 8 on Nathan's birthday so we got up about 7 to eat breakfast and open gifts before John had to leave. Pretty good haul for a 3 year old! And that's not all...that night G-ma Sally and G-pa Doug brought over a couple of other presents. He had a blast opening presents. At first he had to open the cards, and then he started to carefully open the other gifts and I told him to just rip the paper! So, after that he started getting a little more rough with the paper. He requested a train cake again this year, so that was nice since I did it last year! You can see he actually got a train this year to accompany the cake. 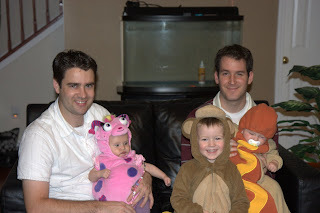 We spent Halloween in South Carolina with Tim and Laisa. Here is John with Alex and Tim with Bree. 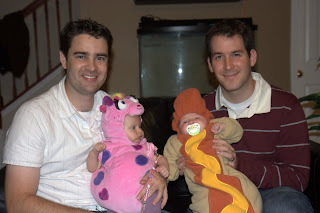 Alex is a hotdog...and Bree made such a cute little monster! Nathan had to join the picture. He's a monkey! He did so good trick or treating-he actually said it this year instead of just holding out the bag for candy. He was ringing the doorbell/knocking until he got majorly scared at one house--this kid dressed up as "the reaper" with the mask on came out from behind some bushes looking pretty scary with a bowl of candy. Nathan freaked out and ran away to hide behind Tim. The scary kid startled us all but it was pretty funny to see Nathan freak out. He wouldn't go up to any doors by himself after that! Alex did not like the hot dog costume. It was probably a little warm for SC. Nathan fell asleep on our way back to the hotel after trick or treating. He has his bag of candy in his lap. 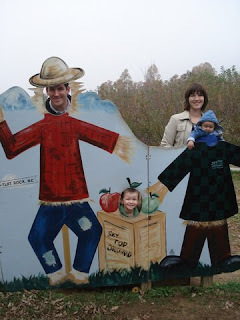 We went out to an Apple Orchard (in North Carolina) with Laisa the day before the race. The goats did lick Nathan's hand when he fed them, he thought it was pretty gross! 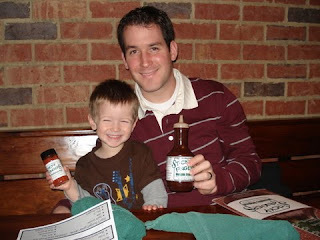 In Nathan's words, "Alex not happy..."
We ate at Sticky Fingers in downtown Greenville, YUMMY! This was my yummy meal after the race and a couple hours of rest. 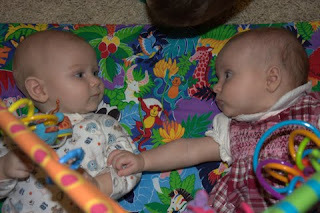 Checking one another out, so cute! We got to roast some marshmallows and make s'mores the night before we left, brought back some good memories of South Pas. We had great time on our little vacation! 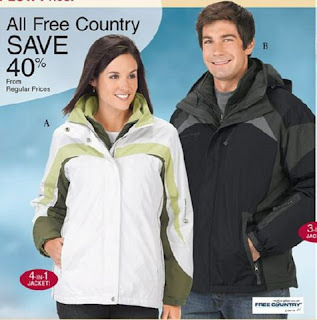 Thanks Tim and Laisa! 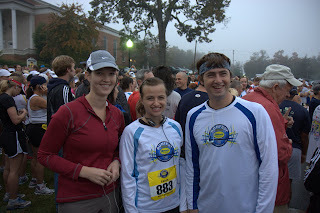 Just minutes before the race started with Laisa and her brother Andy. I only ran with them for the first 10 minutes or so and then I took my slower pace. :) I ran it in about 2 hours and 38 minutes. I would have liked to have run the entire way, but I started walking the uphills since there were so MANY! I finished it though and I wasn't last...that was my main goal. 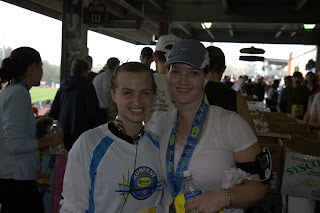 Me and Laisa after the race. I was so hungry I grabbed food and water before I even met up with anyone...I think I might have even had food in my mouth when this picture was taken :) At this point, it felt better to jog or sit than to just walk or stand. WEIRD. I'm not really sure how people run Marathons or complete the Ironman competitions. It's crazy! Here's a pic of my new hair. Took me a few days to really get used to it, but I'm loving it! Nathan in the car watching his movies and eating crackers on our way down to the cabin for Conference weekend! We had a great time meeting Rena (sp? 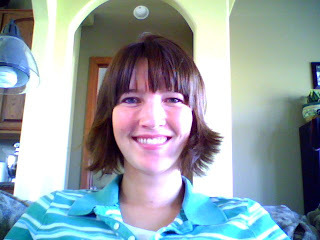 ), a foreign exchange student from Romania living with my parents, and Jarom's fiancee Christa. And of course with everyone else and watching conference. :) Unfortunately I'm lame and too busy having fun to take pictures of all that, so some other time I guess. 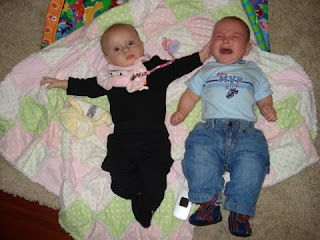 This is Alex and Adelyn (sp? 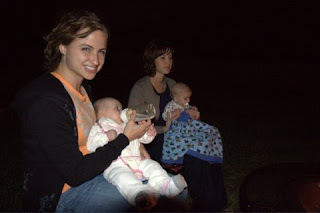 ), my cousin Brian and his wife Whitney's little girl. They are just a couple of weeks apart, so sometimes when we swing through Moscow we stop to say hi! Just a cute pic with Gma Donna! He looks so serious...he really does smile, I just haven't been able to capture it yet. Nathan is "helping" Alex smile here. Good thing Alex has Nathan around!